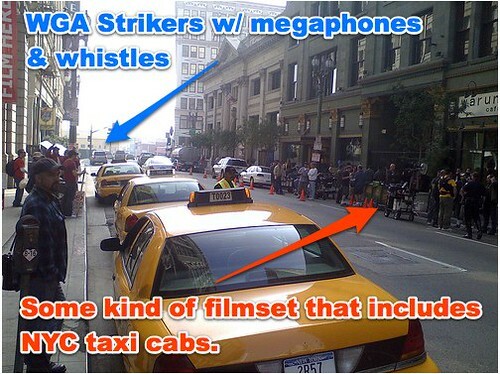 If you don’t have a stake in this WGA strike thing, and want to see something completely amusing I’d recommend heading downtown to 4th Street between Spring and Main and watching the strikers on the north side of the street with their megaphones and whistles and signs, and the film crew on the south side of the street who can’t get anything at all done because everytime they yell “action” one of the strikers busts out the megaphone and asks one of the other strikers for a cigarette or trys to hail one of of their prop cabs. There’s a growing crowd of spectators and I’m guessing this little confrontation is way more interesting that the fliming or striking would have been on their own. More pics after the jump. I actually caught a bit on the news this morning that there are actors doing just this in Burbank. That Julia Louis Dreyfuss was on the new talking about how it was the first time she ever walked a line and that they were interrupting the shooting. It’s a good thing when the actors acknowledge the writers play an important part in the process and support them getting a fair share too. This reminds me of a story I heard from a well known movie accountant of when some line producer forgot to pay the teamsters in NYC. When he showed up, the location was surrounded by huge semi’s preventing any access. The cost of the movie crew sitting around was some huge number. I think they settled on something like $30K to “move along”. I work for Disney and have passed by and through the strike lines several times this week. Everyone seems happy with no overt hostility. While I understand the writer’s position, I also also see the point of view of all the other workers (grips, PAs, electricians, etc.) that want to work and get paid. 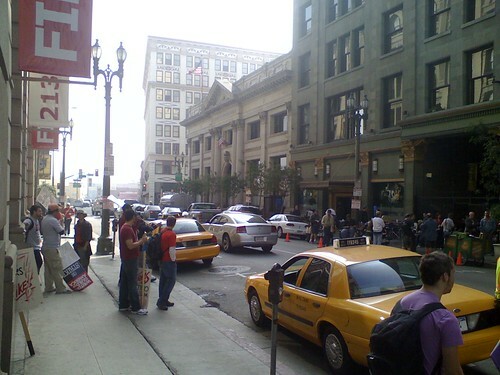 When shooting stops on a show or movie, no one gets paid, regardless if they are on strike or not. No easy answers here, it’s all shades of grey. But to think that this type of action doesn’t have collateral damage on people who are not ‘evil, greedy producers’ is incorrect. Most of the people on that film crew have nothing to do with the business disagreement between the writers & producers, yet they are ones receiving the brunt of the anger. They were shooting Monk. They’re also shooting Hot Shots near there soon… predicting more of this hullabaloo.